A friend just shared this video and I'm sharing it with you. I don't know about you, but I've been trying to meditate for years and always have an 'excuse' for not doing so. Enjoy it and have a good day. Love this video! 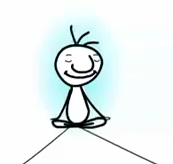 It definitely captures what meditation can do for you for one minute or more..its really not about time...but one minute is better than nothing thats for sure! And one moment meditation every moment is the ultimate!